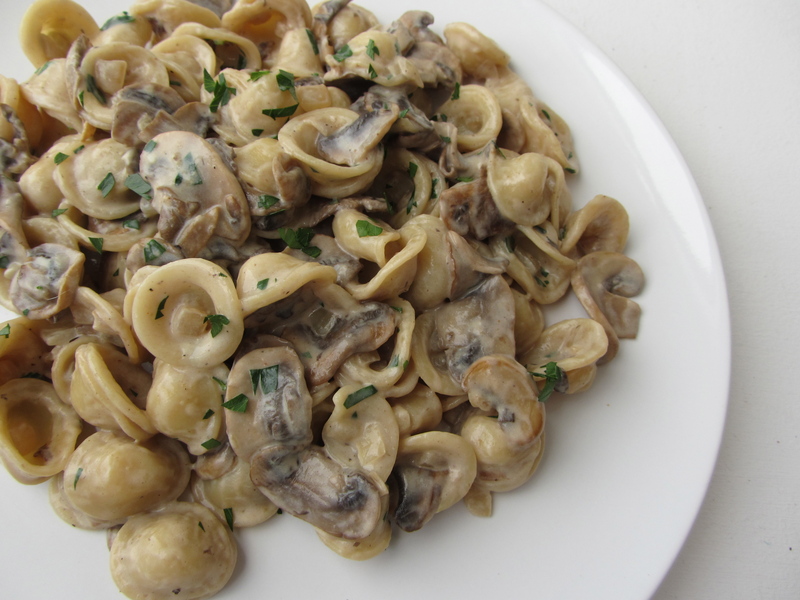 From Italian, orecchiette translates to “little ear,” which is an appropriate name since this small, round pasta cooks up into little pockets (or ears!) that are perfect for holding onto cream sauces. Most times, a pasta sauce can be prepared by the time the pasta is ready, but since this sauce has a longer cooking time, timing is key. 1. Start the sauce: heat 1 tablespoon of olive oil in a large sauté pan over a medium-low heat. When the oil is hot, add the mushrooms and cook until they have browned, about 7-8 minutes. Remove mushrooms from pan, set aside. 2. Now start cooking pasta in a large pot of salted boiling water until “al dente,” about 9 minutes. Stir occasionally to keep the pasta from sticking together. 3. Return to the sauce: add another tablespoon of olive oil to the pan and cook the garlic and onions until they are tender and translucent, about 5 minutes. Return the mushrooms to the pan. Add the butter; stir until melted through, then sprinkle the flour over the pan and toss to evenly coat the mushrooms. Continue to sauté to cook away the raw flour taste. 4. Reduce heat down to low. Slowly pour in the half & half, stir to combine and deglaze the pan (scraping the bottom with a wooden spoon). Stir in a dash of grated nutmeg. 5. Reserve 1/2 cup of the cooking water, then drain the pasta and add to the creamed mushrooms. Toss together with the sauce, adding the reserved cooking water as needed to loosen the sauce. 6. Turn off heat, toss in the grated parmesan and a handful of parsley. Serve immediately.